It's time to look to an unlikely source as your new go-to for all things beauty. Yup, your kitchen is full of ingredients that actually make real super skin friendly staples. Cucumber decongests, mint purifies and lemon lightens, so pop them to the top of your shopping list cos it's time to stock up. Thought honey was only good for spreading on your morning toast? Well you thought wrong sister. It's actually one of the best natural remedies for smoothing and hydrating skin too. Take it from us, you can trust those bees to give you a plumped and dewy finish before you can say honey pot. In celebration of these miracle ingredients, ​we've rounded up the best at home remedies you can whip up right in your kitchen. Cos when it comes to skincare, basic is best darling. Before trying out your new face mask, make sure you carefully remove all your makeup to get rid of any dirt or impurities. Then apply your mask all over your neck and face taking care to avoid the eye area, then rinse with warm water. FYI as these masks are 100% natural with no nasties or preservatives, you must use them quickly as it won't be long before they turn stale. Yuck. Peel the cucumber, to remove the pesticides from the surface of the skin. If you want an extra gentle mask, opt for the organic version. Cut it into pieces and mix it together with the yoghurt. Apply liberally to the skin and leave on for 15 minutes. This green veg is packed full of water, so it moisturises, cleans and makes skin look radiant and happy again. Full of vitamin C, it's also known for its cleansing and astringent qualities. We're sold. Those who have super dry, and tight skin who experience tugging, reddening easily, etc as a result. Mix or crush the banana and avocado together to create a perfectly smooth mixture. Add the honey to make the puree, then apply to the face and leave on for 10 minutes. Thanks to the high level of proteins and vitamins A, B and E that these yummy foods contain, they hydrate your skin from the inside out. The avocado protects your skin from external aggressions, while the banana softens, nourishes and regenerates. If we weren't already obsessed with avo before, we are now! Those who burn the candles at both ends with too many nights out, (guilty!) also those of you who are feeling particularly stressed out whether that be work or home related, and your skin is showing it. Beat the egg white and add the honey and lemon juice. Incorporate the yogurt and stir until the ingredients come together. Leave on for 15 minutes then rinse. Honey is rich in mineral salts, vitamins and amino acids which makes it super soothing, purifying and softening, leaving your skin dewy and glowing. AKA Insta ready. Tired and dull skin that lacks brightness and luminosity. Mix the hot water with oatmeal, then wait 3 minutes for the water-soaked flakes to swell - think morning porridge but for your pores! Once ready, add the yogurt and egg white to the mixture, then apply a super thick layer to the face and rinse after 15 minutes. B vitamins and minerals found in oats have anti-irritant and softening properties. Enriched with lactic acid, the yogurt exfoliates, hydrates and reveals silky, smooth skin. Calcium also promotes cell renewal for a radiant complexion. We're talking #nofilter. If you have ageing skin and are looking for a natural alternative to anti-wrinkle creams on the market. Beat the egg white until it becomes clear, then add the rest of the ingredients and mix well. Apply a thin layer over the entire face and leave to work its magic for 20 minutes. Egg white is a high protein food that is known to be a natural tensor. It tightens the pores of the skin and acts as a natural anti-wrinkle aid. Not just for the gym freaks then! Those that have oily or combination skin (the skin that shines on the T-zone). Mix the oatmeal and yoghurt carefully together, then add in the lemon juice and stir. Massage your face gently while applying it, then leave for 15 minutes. Once it's been 15 mins, rinse off but take care not to rub the skin too hard as this will just create more oil. The lemon has both exfoliating and lightening powers. It erases imperfections on the surface of the skin such as small pimples and blackheads thanks to its antibacterial and antioxidant powers. It really is a juice of many talents. For those who want to prevent the oxidation of the skin, caused by pollution, sun, tobacco and all those every day nasties that make us less beautiful, and thus prevent ageing. 1 c. Vegetable oil OR Argan oil OR olive oil OR walnut oil. Pick just one. 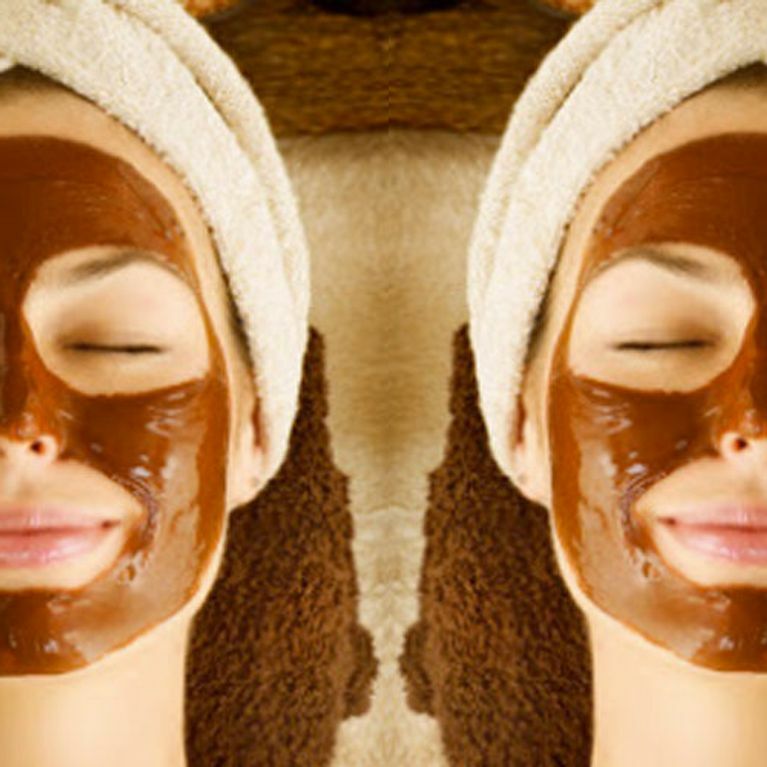 Mix all the ingredients together, (melt the chocolate in a pan of boiling water before making the mask). Mix well until smooth. Pop on to your face and leave for 20 minutes before rinsing. And er, try not to eat it eh? The antioxidant capacity of cocoa is three times greater than that of green tea. Here's the best news you'll hear all day: eating 1 square of 70% cocoa dark chocolate is excellent for the skin and your health in general. Yay! Mixed and oily skin. City-dwellers and commuters who seek to eliminate the toxins that clog their pores on a daily basis. Mix the 3 ingredients well until you get a smooth paste without any lumps. Apply a thick layer on to your face avoiding the delicate contour of the eyes and lips. If the clay dries, you can moisten it with steam (place your face a few inches over a bowl of hot water - easy). Leave to work for between 10 and 15 minutes. It has purifying, healing and absorbing properties and it rebalances the skin by absorbing the excess sebum which causes those annoying black heads. Blemishes be gone! Inspired to get making some at home remedies? Let us know how you get on @SoFeminineUK!